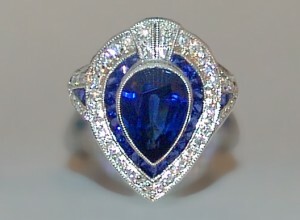 Superbly crafted, elegant platinum ring set with brilliant blue pear shaped sapphire of 3.25 ct + sapphire accents. Hand made to the highest standard. Contemporary.